If a major source of back pain has been shown to be the facet joints by performing the facet joint block,then the patient is a candidate for facet rhizotomy. The main ingredient in the facet block is a local anesthetic which would have only provided temporary relief for several hours, but would have diagnosed the facet joints as the source of pain. 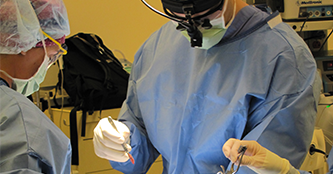 A rhizotomy is a procedure which uses special needles and radio frequency current such that the tiny nerves which were numbed temporarily with the facet block can be cauterized producing a much more long lasting period of pain relief. This is done with twilight anesthesia and takes about fifteen minutes. It can be performed at all levels of the spine.